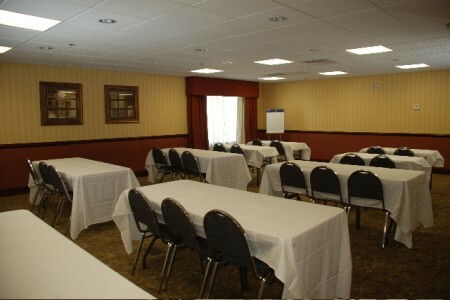 From birthday parties and baby showers to meetings and conferences, you can enjoy stress-free gatherings with up to 50 guests in the meeting room at the Country Inn & Suites, Oklahoma City Airport. Keep your guests happy and productive with complimentary water and coffee, free high-speed Internet and audiovisual equipment, such as an LCD projector, a projection screen and a dry-erase board. You can also take advantage of off-site catering services to make sure any event is well supplied with hors d’oeuvres, desserts or even a full banquet.